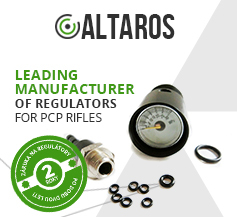 Brand Altaros is a specialized shop that since 2008 develops and offers original regulators for PCP rifles (airgun). Over time, we have gained extensive experience of PCP issues and primarily gained many satisfied customers around the world. The first high-pressure compressor 300bar we built in 2009. Which was only for our own use. Over time we have evolved further construction and the final model tested for 2 years in our workshop. Almost all machine parts is produced by our trained staff in our workshop on precision CNC machines, so we can ensure maximum accuracy and quality production. Our main goal is a satisfied customer, who is always our top priority. We believe that you can become one of them.